ADD POF for Sun-Weather-Graffiti Protection! The reality is that all of us whine, complain, blame others, and try to avoid responsibility. It’s part of the human condition. 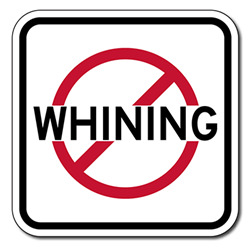 Use this sign to let everyone know whining is not allowed. Perfect for the gym, retail stores, and auto shops. DOUBLE the working life of your No Smoking Symbol Signs by adding 3M Protective Overlay Film (POF)! 3M’s high-tech POF protects sign faces against fading caused by the sun and harsh weather—and makes graffiti and sticker defacement damage easy to clear away without harsh abrasives.